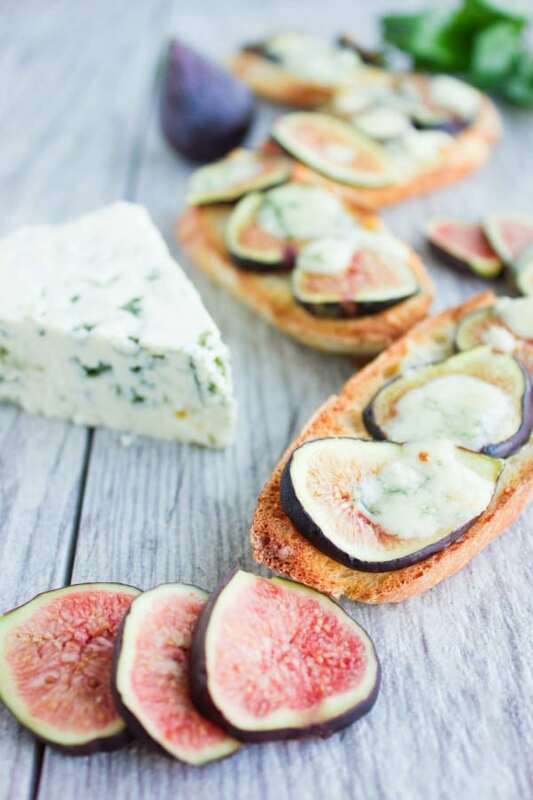 This Fig Blue Cheese Honey Crostini recipe is the perfect quick and easy last-minute appetizer or finger food to serve to guests! Serve these gorgeous creamy and fruity crostini fresh out of the oven sweetened with a drizzle of honey! This Fig Blue Cheese Honey Crostini recipe is the perfect last-minute appetizer or finger food to pull out for a five-star start to any meal. It’s cheesy, sweet, crunchy, fruity and just wonderful paired with oven-warm crostini. Honey adds a sweet finishing touch to the fig and blue cheese, but it’s just as good with a balsamic reduction, or leave even as is with nothing drizzled—either way, all it takes is 5 minutes! 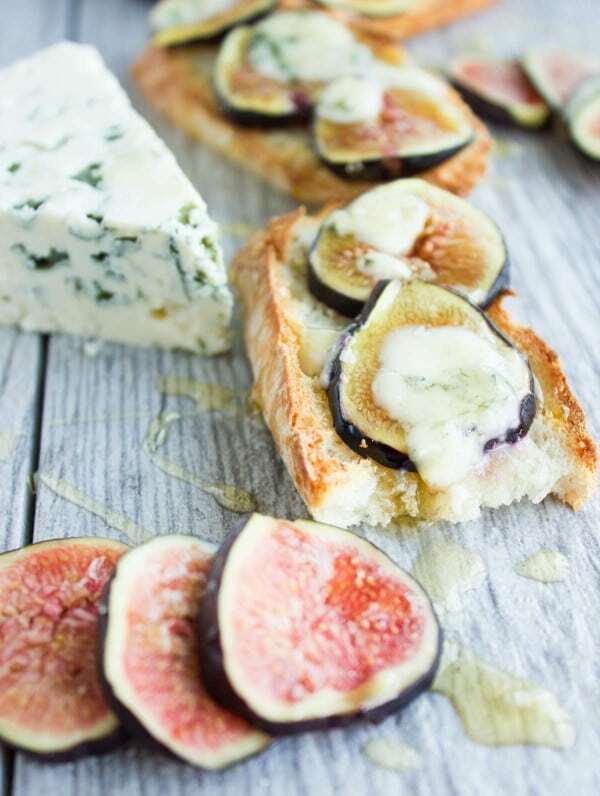 Guys, this Fig Blue Cheese Honey Crostini recipe is a must-try. It’s super quick to make and therefore simply perfect for when you really only have a few minutes to whip up something you can serve to guests as a starter! The recipe for these Fig Blue Cheese Honey Crostini starts off with crunchy baguette slices that have been drizzled with just a bit of olive oil and crisped up in the oven for 10 minutes at 375 degrees. That way, the Fig Blue Cheese Honey Crostini is very crisp. Feel free to use a regular fresh baguette. Once baked, it will have a rather delicate crunch in the middle and a harder crunch only on the edges. You really want that nice crunch when going for a softer cheese fruit combo like blue cheese and figs. Sprinkle a few basil pieces at the top of each crispy baguette slice and arrange thinly sliced pieces of figs on top. Crumble some blue cheese over the figs (more or less to your taste) and repeat with the remaining baguette slices. 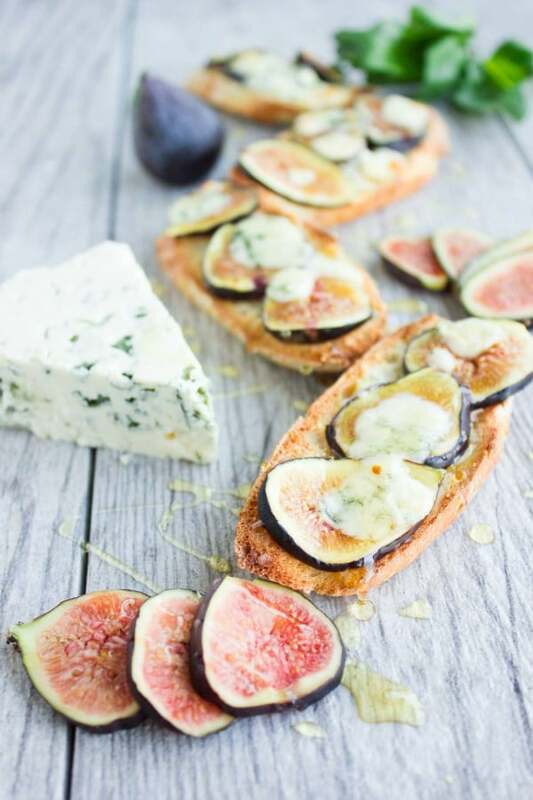 Now, place your Fig Blue Cheese Honey Crostini on a parchment-lined baking sheet and bake for 3-5 minutes just until the cheese starts to melt and the figs are slightly softened. The final honey drizzle is the best part of this Fig Blue Cheese Honey Crostini recipe. Even though I love adding this finishing touch to these easy crostini, I always serve the honey on the side, because some people might not like their Fig Blue Cheese Crostini that sweet. Honey is a sweet favorite and time saver, but a sweet balsamic reduction is another great option for these Fig Blue Cheese Crostini. The best way to make a balsamic reduction is to boil 1 cup of your favourite balsamic vinegar (flavored types work beautifully too) on medium heat for about 10 minutes. The vinegar-ish taste completely evaporates and the mixture becomes thicker and more of a syrup. Note that balsamic reduction keeps thickening as it cools down, and it will taste like the sweet part of the balsamic vinegar, without any acidic taste, just concentrated sweet goodness! 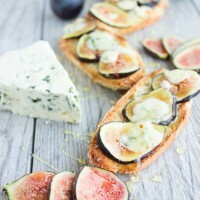 This Fig Blue Cheese Honey Crostini recipe can be made in many variations! Use some peaches, apples, pears, apricots or strawberries instead of the figs, and use any type of cheese you have on hand. Brie, feta, goat cheese, or just about any. I sprinkled a little bit of chopped basil on my Crostini, but any herb would work too. 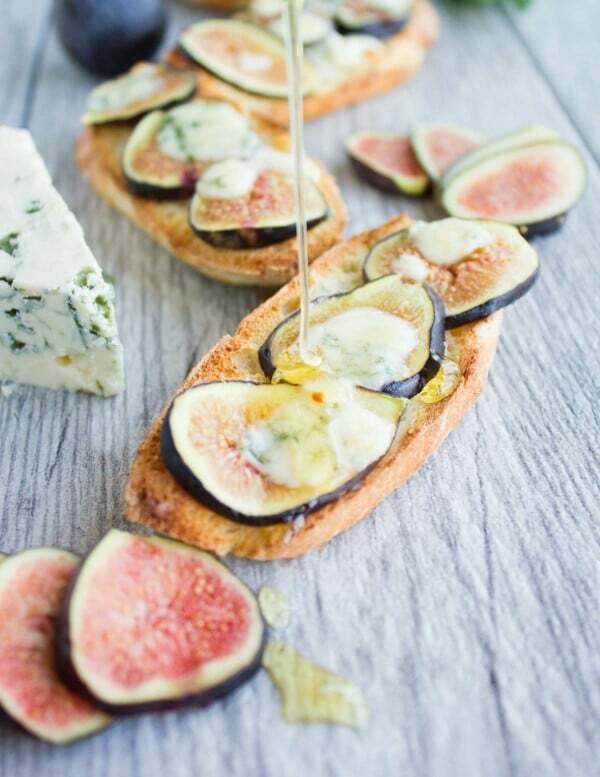 As a finishing touch, drizzle these Fig Blue Cheese Crostini with honey or balsamic reduction. For a gluten-free appetizer, choose homemade gluten-free bread! 1 baguette thinly sliced on an angle , each slice drizzled with a tiny bit of olive oil and crisped up in the oven at 375 degrees F. for 10 minutes. Sprinkle a few basil pieces at the top of each crispy baguette slice and arrange the thinly sliced pieces of figs on top. Crumble a few pieces of cheese over the figs (more or less to your taste). Repeat with the remaining baguette slices and place on a parchment-lined baking sheet. Bake for 3-5 minutes just until the cheese starts to melt and the figs are slightly softened. Serve as is or drizzled with honey or balsamic reduction. such wonderful flavors for an appetizer! 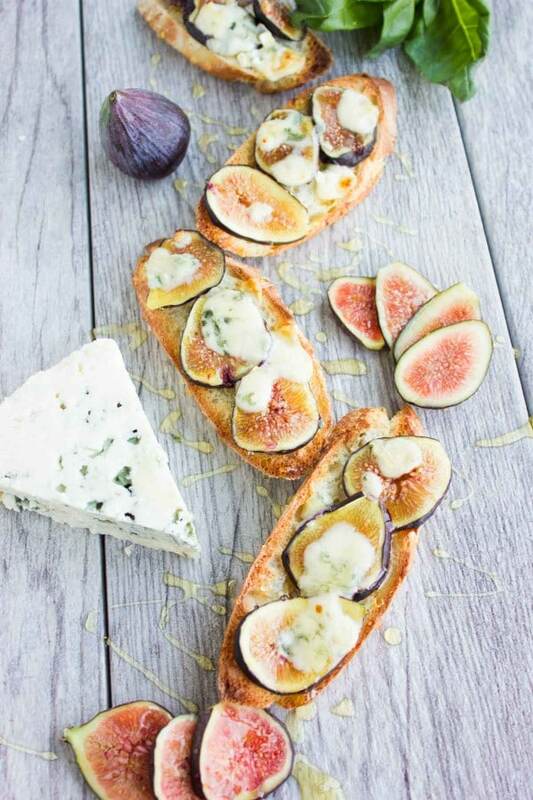 Blue cheese and honey just go so well together, and the figs are just so delicious! What a great recipe! I love blue cheese- adding honey and figs is the best combo ever. One of my favorite appetizers! Figs and blue cheese is such a beautiful combination and I will love it drizzled with honey or with balsamic reduction. What a great appetizer and so simple to put together. I agree with you fresh fig and blue cheese is awesome combo . That too with cheese honey corstini is wonderful appetizer any day. It’s super easy too! 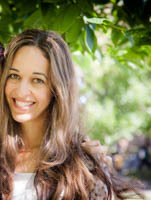 Thanks Swathi!